Filled with magic and mystery, Germany’s Black Forest is a place of legend serving as the backdrop for the classic tales we’ve all come to adore. Darkness and danger lurk around every corner but those who dare to enter the forest and face challenging encounters with creativity and cunning will come out on the other side enriched for having taken the journey...Into The Black Forest! The game takes places over 2-3 rounds (depending on the number of players) with each round consisting of 3 “encounters” or hands. In the game, each player uses their own deck of cards numbered 1-12 depicting 4 creatures that will help them journey through the forest; frogs (#1-3), squirrels (#4-6), lynx (#7-9), and owls (#10-12). In addition to the creatures on the cards, each deck has a unique distribution of 4 suits of magical items; wands, potions, spell books, and swords. At the beginning of each round, players will draw 6 cards from their personal deck and reveal 3 cards from the Encounter deck in center of the play area. The Encounter cards will direct the play of each hand and provide a glimpse of what challenges lie ahead for future encounters. Players will take turns playing a card to an open slot around the outside of the Encounter cards with each side scoring in a different way once the Encounter card is surrounded. At the bottom, the low card will beat the high card, taking the value of the high card for points. To the left side, the card played will score it’s value only if it’s suit matches one of the cards played above. On the top, the high card beats the low card, taking the value of the low card for points. And on the right side of the card, players may each play one card face down, hoping to meet the unique win condition for the card or to bluff or sluff to throw off the other adventurer and buy themselves extra time. After playing three hands, new Encounters are revealed and players choose from their remaining cards and new newly drawn cards to prepare for the next round. Into the Black Forest is a new classic card game that provides a challenging puzzle of hand management, planning, and tactical decisions. Fans of trick-taking, area control, and light bluffing will love taking a journey Into The Black Forest! 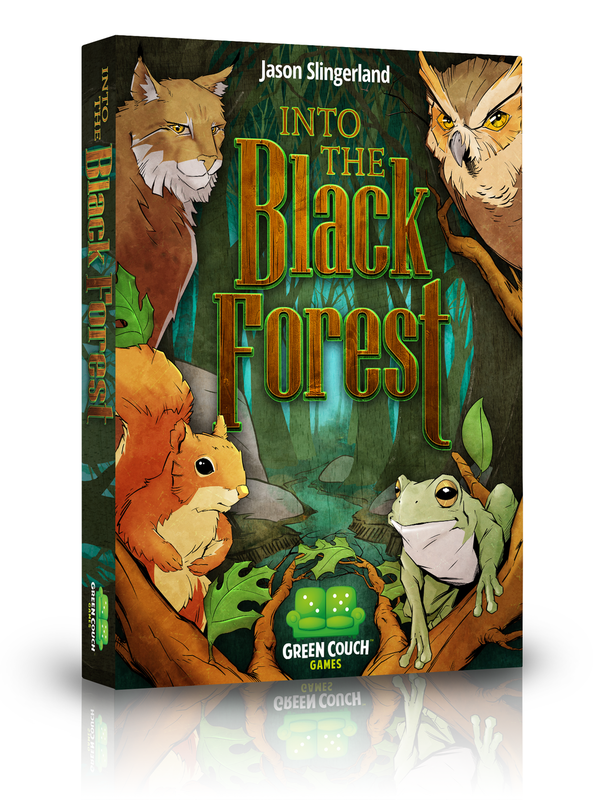 Into The Black Forest is a game for 2 to 4 players, ages 8 and up. Jason Slingerland (designer of Unreal Estate and co-host of The Building The Game Podcast) designed the game while Darryl T. Jones (designer and artist of Dobbers: Quest For the Key) served as illustrator and graphic designer. The game plays in 30-45 minutes. The game is set for a Kickstarter campaign launching on September 12, 2018 with plans for a Q1 2019 release.